Frustrated by the lack of highly academic Christian schools for our own children, my husband and I, along with several other people, founded Liberty to be both Christian and academically excellent. I firmly believed “As Christians we should be graduating the best educated students in the nation!” for them to gain respect and influence in society. Therefore, the goal from the beginning was for Liberty Classical Academy to become known as one of the top academic schools in the Twin Cities, but intentionally Christian. Academic excellence is claimed by many college preparatory programs. At Liberty Classical Academy, however, it refers to an intentional training of students’ minds to both think and learn on their own—a goal conspicuously missing from modern educational philosophies. Liberty goes well beyond the common educational practices of simply completing curriculum, dispensing content, and providing shortcuts to gain college credit. It stands in contrast to Advanced Placement (AP) and Science, Technology, Engineering, and Mathematics (STEM) methods of simply teaching to a test or directing learning towards a specific career module. Liberty’s classical approach to education requires students to think, discuss, evaluate, debate and share, regardless of the subject matter, as well as learn the content. Its classical teaching method develops students who think deeply, speak articulately, learn effectively, and lead, regardless of their college or career choices. The distinct stages of a classical education lead students along a continuum of academic development second to none. The broad framework of the traditional liberal arts: Math, Science, History, English, Art, Music, Drama, and Physical Education serve as the foundation. The integration and interaction between subjects builds on this foundation to fully develop a student’s understanding of each one. The broad base of English and History serve to provide a human perspective and fodder for invention in Math and Science. Adding Logic, Rhetoric, Languages, and Biblical integration induces students to apply the art of argumentation, writing and speaking to view topics from multiple perspectives. Liberty holds students accountable to high standards in writing, speaking, respectful dialogue, and debate. This enables them to more effectively apply their mastery of subject matter. Physics, Calculus, enlightenment philosophers, and authors such as Dante, Milton,Tolkien, and the like, have all proven invaluable for developing students’ gifts to the maximum of their potential. Liberty has alumni studying and working in medicine, engineering, aeronautics, architecture, computer technology, business, music, teaching, and more. Liberty seeks to provide students the academic tools to maximize their intellect, talents and abilities for God’s glory. From this foundational K-12 education, they earn the respect of their peers while bringing Christian influence into the marketplace of ideas. As shared above, Liberty Classical Academy was founded from the very beginning to be a highly academic institution, but also purposefully Christian in approach and execution. What does educational excellence look like in Liberty classrooms and how are these methods and practices different from other programs? At all levels of the program, students are being trained in methods that are not only time tested, but developmentally appropriate for their ages. We won’t have second grade students writing long form essays and we won’t have seniors completing songs and chants. Why? Because it wouldn’t be age or developmentally appropriate for either to do so. In order to remain challenged, students are given the opportunity to move ahead in math, sometimes completing two years of calculus by the time they graduate. Science is taught in discrete subjects such as life science, chemistry, etc. rather than as general science, even from the youngest ages, enabling students to better remember the foundational concepts for the critical upper school years. We meet students where they are developmentally to maximize the potential of their God given abilities. We teach students cursive writing and require it through eighth grade. Students are required to write their thoughts in complete sentences, even at early ages. In spelling, our teachers show the students how the English language works and what rules to use (and what are the exceptions) as opposed to merely memorizing progressively more difficult words. Our students are taught how to spell and how to write, not merely to write often and guess at the proper spelling. These short examples equip our students to be effective communicators later in life. If our students can write, spell, and communicate well, they can be heard more effectively in the marketplace of ideas. Our middle school years are marked by a careful study and application of logic. The ability to use logic to not only spot poor arguments, but make good ones, set our students apart from nearly all their contemporaries. The logic skills gained during the middle school years dovetails beautifully with the study of rhetoric in the upper school years. Rhetoric is the art and skill of communicating persuasively and effectively in a manner that is pleasing to the ear and to the audience. These two skill-sets, logic and rhetoric, developed through a Christian worldview are essential to all paths of future study and careers, allowing our graduates to be strong, persuasive, yet gentle voices for truth in a culture awash in lies. 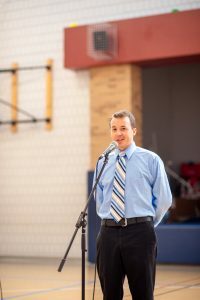 Furthermore, Liberty students are required throughout their years in the program (beginning in Kindergarten) to speak publicly and eventually persuasively. Again, this is done at age appropriate levels. We won’t ask a third grade student to recite Jefferson’s First Inaugural, but neither will an eighth grade student share a selection from A.A. Milne’s Winnie-the-Pooh. The capstone project of a Liberty graduate is without a doubt, the senior thesis. This project contains nearly a semester’s worth of research on a controversial cultural, legal, or moral topic. Student research is quantified into a twenty–page thesis, that is publicly presented, and defended with a live audience. In the space that permits, we must touch on history. Liberty utilizes a four year history sequence of ancient, medieval, renaissance, and modern histories. History courses are required for all four years of upper school, as are math, science, and literature and composition studies. At Liberty, history is the hub on which the spokes of other subjects turn. For example, seventh grade students study Renaissance History. In seventh grade, students read literature from the Renaissance era in literature class, they compose research projects relating to the great topics of the Renaissance, they study art and music from the Renaissance and they complete their own art and music projects in the same styles. History is treasured at Liberty and is truly an integral component of the program. 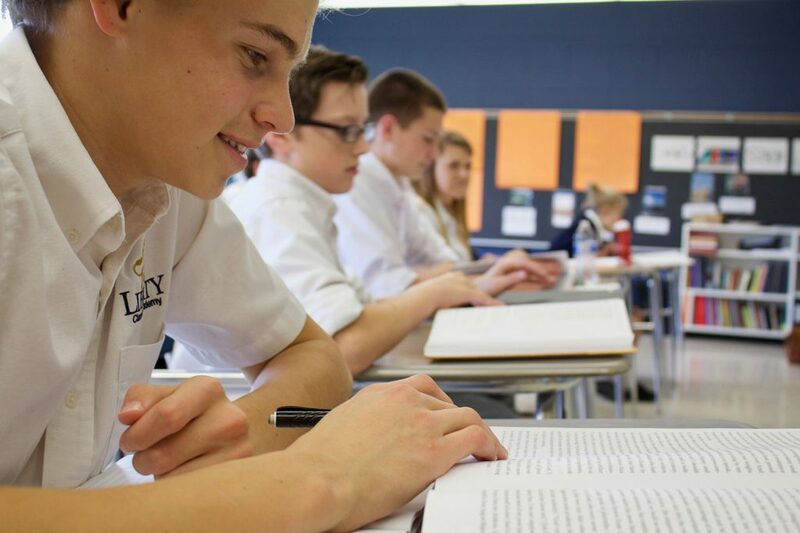 Throughout a Liberty Classical Academy education, students are taught how to think deeply, communicate effectively, and know not only what they believe but why they believe it. Taken together, Liberty graduates are academically and morally equipped in an excellent fashion, not only for the challenges of higher education and the workforce, but in all aspects of a life lived unto the Lord. Educational Excellence is foundational and it’s building lives that inspire here at Liberty Classical Academy.